"Understand how backups, tiering, and archiving technologies differ"
Each one of backups, tiering and archiving addresses different aspects of a complete data management solution. Together they address legal, regulatory, information security, and economic concerns. What are the software tools available to address the complications faced in data backup and recovery? 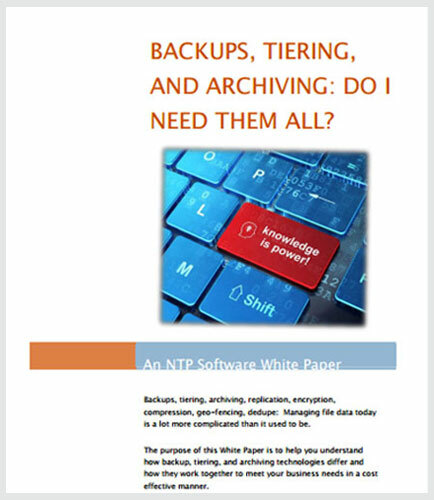 The purpose of this white paper is to help you understand how backups, tiering, and archiving technologies differ and how they work together to fight against data loss and meet your business needs in a cost effective manner. Backups offer protection against data loss by providing the means to restore your data after a hardware failure or some other data loss event. Tiering is a strategy for managing the cost of file data. By identifying unused or seldom used files and handling them accordingly, significant saving can be realized. Archiving is necessary for regulatory compliance, provides inexpensive long-term file storage and, if implemented correctly, offers a means of retrieving individual files. Read this White Paper to Dig Deeper on !